Among the most popular artists on RuNet (the Russian-language segment of the Internet) paints some unsightly manifestations of Russian mentality. 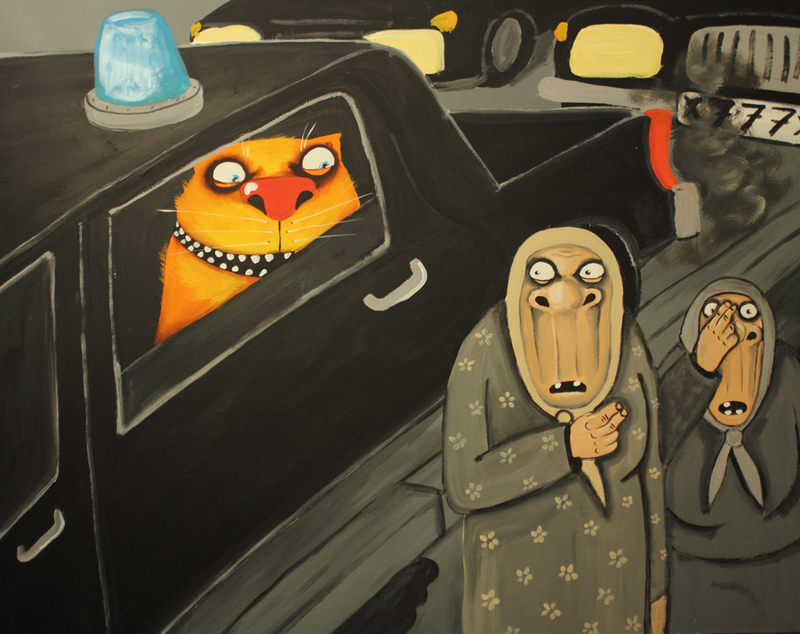 In Vasya Lozhkin’s works, supposedly cute cats co-exist with ghouls and mad old women. Vasya Lozhkin is one of modern Russia's underground art stars. He has not been nominated for prestigious art awards or exhibited at the Tretyakov Gallery, but social networks are filled with his works, with each being reposted thousands of times. His artistic language is unmistakably recognizable, while his allegories are clear to any Russian, even though describing them is as difficult as explaining a joke. Lozhkin's key characters, repeated throughout his paintings, are a ginger cat and a vile old woman in a headscarf. The feline is beloved of Internet users (and popular with buyers), while the female seems inspired either by Baba Yaga, the wicked witch of Russian fairy tales, or is a collective image of an evil neighbour. Apart from these, Lozhkin's world is inhabited by bears, hares, pigs and other animals, as well as drunken, unshaven men and a variety of ghouls. His world is dangerous and unattractive; scary faces bathe in oil, scoff, drink and threaten with death. It looks like a wicked satire on contemporary reality, ridiculing human vices, economic sanctions, lack of political freedom and the Soviet legacy. In Lozhkin's fictional town of Kobylozadovsk (translated from Russian as "a horse's rear end"), you can seemingly recognize any small town in the Russian hinterland. Many of his paintings may be confusing for foreigners. Lozhkin sometimes illustrates aphorisms, jokes, phrases from movies, slogans from Soviet posters or well-worn clichés that every Russian is tired of seeing, in a straightforward way; like in the triptych Motherland – Over There. In this, a colourful and happy 'motherland' is represented by a family of bears in red shirts under a birch tree, a 'sputnik' satellite flying through the sky, while behind a barbed-wire-fenced 'over there' resembles a black-and-white hell with devils. Other works are more universal – a gloomy, freshly washed cat in the shower with the inscription “I will take revenge”, or “Portrait of Kitler” (a cat looking like Hitler) – and sometimes even lyrical, like Den, with a female bear and a bear cub under the quilt. While he has been involved with music since childhood, and formed his own punk band right after high school, he became popular not for his music but for his pictures. Lozhkin considers himself a ‘punk’ in painting. Vasya Lozhkin is a pseudonym, which became his nickname on a LifeJournal.com blog more than a decade ago. The artist got caught up in the Internet and, after receiving yet another gallery rejection, began posting his paintings on the Internet. That is where Lozhkin found fame. The original images, painted with acrylic on canvas, received a digital life and his paintings began to find buyers. Five music albums have come out in the last few years, art galleries across the country and the Moscow Central House of Artists have hosted his exhibitions, and a Prague nightclub used images of his cats to decorate its walls. The artist denies having any political, social or other influences - much to the amusement, anger or irritation of his admirers and critics. In his imagery, there is no attempt to portray (and smear) the whole of Russia; each observer sees what they want in his paintings. He is interested in human madness, psychosis, stupidity, hallucinations, borderline states and the hidden corners of the soul: the world as if seen through the eyes of a madman. His pictorial images have no specific prototypes – Lozhkin bases all his characters on his own image. He just takes a mirror, contorts his face, exaggerates his features and comes up with one big self-portrait. Another source is suburban trains, which he used to use a lot, when he lived in the tiny town of Solnechnogorsk, near Moscow. At that time, he carried a notebook for sketches, and if he found an image amusing enough, he would invent a story behind it. Perhaps, only the cat – a creature found in Russia in almost every village house - appeared all by itself. By Lozhkin's own definition, the genre of his works is a modern lubok – a traditional Russian popular print with a simple plot of an amusing or didactic nature, primitively painted and provided with an explanatory inscription. Essentially, it is a fairy tale and, despite the impression of scary faces that populate his paintings, according to the author, with a happy ending.